It’s a typical Thursday night at Carlyn’s Cove, a pub on Boston Post Road in Larchmont. The door opens frequently after about 9:30 p.m. — once most of the children are in bed — and a group of men trickle in. By about 11, they may be 20 to 30 strong, shooting darts, playing pool, having a late-night snack, watching a game on one of the Cove’s nine TV screens, or simply schmoozing at the bar. But these guys are no strangers to one another. 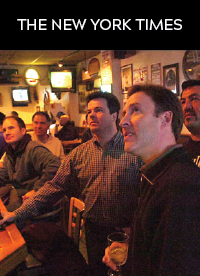 Ranging from their mid-30s to 50-something, they are gathering for their weekly night out together, a sort of social support group for a growing pack of sports-loving suburban dads.